Sean Gallup/ GettyRequirements for a driver’s licence differ from country to country. While how you get your licence, as well as how much it costs may vary around the world, one thing remains the same: getting it is a point of pride and a day of celebration. In Sierra Leone, requirements include playing a traffic-related board game, while in Russia, drivers must take a whopping 150 hours of theory classes. In Brazil, you need to pass a psych evaluation. Keep scrolling to learn more about how getting a driver’s licence differs from country to country. The United States is one of few countries that allows 14-year-olds to drive. ShutterstockThe United States doesn’t have too many restrictions. In the US, some states – like Alaska, Arkansas, and Iowa –allow 14-year-olds to drive with a learner’s permit. But since driving regulations are controlled by state governments, this varies by state. For most states, drivers must take a written test to earn a learner’s permit and then take a driving test to get a licence. Generally speaking, classes and driving lessons are not required. While requiring a higher minimum age, the UK tests are similar to those in the US. Carl De Souza/Stringer/Getty ImagesThere’s a lot of testing to get a licence in the UK — except if you’re the Queen. In the UK, one must be at least 15 to be eligible for a driver’s licence. At that time, you can apply for a provisional driver’s licence which is a simple application process. Only then are you able to sign up for driving lessons, but you will need a provisional licence to take the theory test. Once you pass the mandatory theory test, then you can take your driving test. This applies to all citizens except for Queen Elizabeth. She does not need to take any tests and does not need a licence to get behind the wheel. Meanwhile, getting a driver’s licence in India can be shockingly easy. Design for Health/ FlickrRoads can get quite busy in India. In parts of India, one can allegedly buy a licence without taking any sort of driving test. According to India Today, the government has been working to make road tests more accessible in New Delhi so that more people can be properly certified. Generally, this practical test requires parallel parking, reversing, and driving through eight loops. Similarly, in the past, you didn’t have to take a test at all in Mexico. Mario Tama/ GettyIt’s relatively easy to get a licence in Mexico. Up until 2017, many citizens of Mexico did not need to show any proof that they were capable of driving in order to get their licence. While it does vary by region, most only required a blood test (to have the information be easily accessible in the event of a severe accident), a written test, and a small fee. However, Mexico City is taking a step in the right direction, as officials have created a law imposing a mandatory driver’s exam, which requires lessons, a theory test, and a practical test. In Brazil, you have to pass a psychological exam. ShutterstockIt’s a lengthy process in Brazil. Brazil has some of the toughest regulations when it comes to obtaining a driver’s licence. Before even getting into a car,people must undergo a psychological exam to determine if they are mentally fit to drive. The test aims to uncover, among other things, aggression potential and signs of alcohol abuse. Drivers must also enroll in nine to 15 driver’s education classes. And even after passing the extensive exams, drivers only get a temporary licence for one year.Only if they commit no traffic violations during that year are they awarded a Brazilian licence. The Netherlands sometimes requires a psychological evaluation too, but has specially trained examiners to deal with people with anxiety. Dragana Gordic/ShutterstockThe Netherlands has specially trained examiners. To obtain a driver’s licence in the Netherlands, some – like those older than 75 or expats -are forced to get a Certificate of Fitness, which proves that they are physically and psychologically fit to operate a car. But the best part of the country’s system – which includes mandatory lessons, a theory test, and a practical test – is that if you are feeling too anxious, you can request a faalangstexamen, an examiner who is specially trained to work with people with anxiety. Likewise, earning a licence in Denmark is lengthy and thorough. Jorge Lascar/ FlickrIt takes a lot of practice hours in Denmark. Denmark’s minimum driving age is 17, but before 17-year-olds can take their driving exam, they must complete 28 hours of theory classes and seven hours of first aid training. Drivers must also practice on slippery roads and spend additional hours focusing on special maneuvers, like reversing in slalom and driving a figure eight. Proof of this training and the passing of the written test is necessary before the practical driving exam. It’s just as difficult in Russia. Spencer Platt/ GettyDriving in Moscow, Russia, is not easy. To get a licence in Russia, drivers must take 150 hours of theory classes, as well as an additional 56 practice hours behind the wheel. The practical test is no cake walk either, as there are two parts: a test on a special driving course, followed by a test on city streets. But Japan is one of the hardest places to pass. Nicholas Cole/ FlickrIt’s no easy task to get a licence in Japan. Not only do drivers have to wait until they’re 18 to get a licence in Japan, but there’s also a strict practical test they must pass. If the driver makes one mistake – like driving too far to the right – they instantly fail the test. In fact, only 35% pass the test. The practical road test takes place on an outdoor, looping track that resembles real street conditions. Drivers must maintain a speed of 19 mph and follow a strict set of rules. For example, they must say, “I am making a turn” before actually making that turn to pass. Hungary is one of the few countries that require first aid training. Matt Cardy/ GettyDriving in Hungary requires first aid training. In Hungary, drivers must sit through hours of theory classes before a difficult theory test. They must also pass a first aid test in order to be able to take the actual driving exam. In Sierra Leone, drivers are required to play a board game to get their licence. CDC Global/ FlickrSierra Leone drivers must master a board game first. Sierra Leone has created an ingenious alternative to endless hours of driver’s ed. Instead of attending lengthy classes,drivers in this African country must play a board game. The game titled “The Driver’s Way” is said to be a cross between Monopoly, Scrabble, and trivia. Potential drivers must purchase the game for $US14 and play it at least once before taking the practical test. 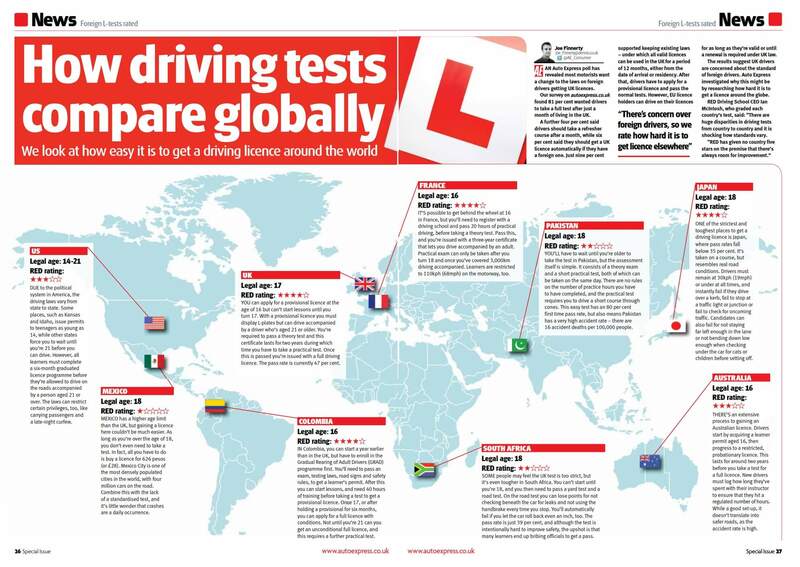 Per Reuters, before the test was introduced, many drivers in the country had never taken any test whatsoever to obtain a licence, instead just paying money for it. They thus didn’t really know rules and road signs, which is where the game comes in. It may take a while to get a licence in St. Lucia because there are only two examiners. Prayitno/ FlickrThere’s a long wait to get a licence in St. Lucia. On the island of St. Lucia, drivers only need to pass a theory and practical test, but there is one big issue: there are only two examiners who can evaluate a driver and award them their licence on the entire island of St. Lucia. Residents of the island are petitioning to bring on two more examiners to help ease the long wait time. Although it is unclear exactly how long the wait time is, St. Lucia Times reports that it’s long enough that some students’ permits and medical certificates expire before they get a turn. Saudi Arabia has recently changed its laws to allow women to earn driver’s licenses. Sean Gallup/ GettyWomen were given licenses for the first time in 2018. Up until June 2018, women were barred from getting a licence in Saudi Arabia. Now, thousands of women are flocking to driving schools. However, female drivers will need to spend more money to earn their licence than males. For men, it costs around $US120, but for women, it costs between $US500 and $US800. New women drivers must also take an additional 90 to 120 hours of theory and practical lessons before they are allowed to take the driving exam.